Spend a day exploring this unique Brooklyn neighborhood. 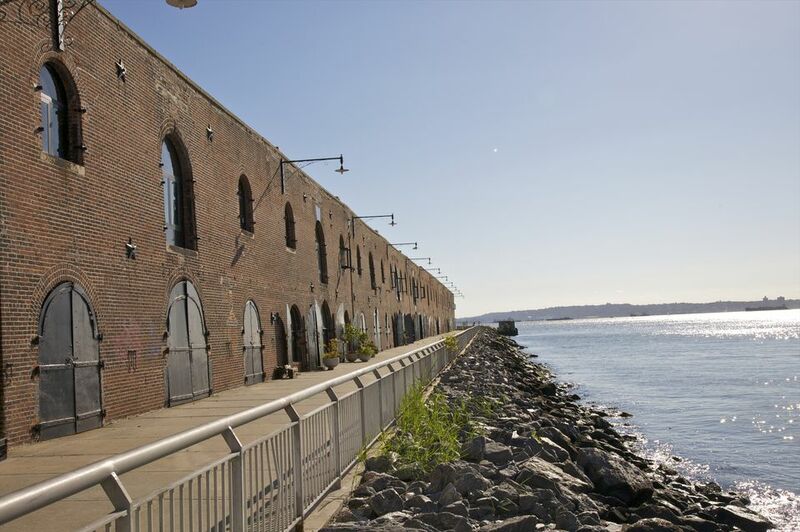 Red Hook may be a bit out of the way, but it's a great place to explore for a day. Walk down cobblestone streets, head to the Red Hook Ballfields for delicious South American food, or just relax and enjoy the views of Lower Manhattan from the neighborhood's waterfront parks. Van Brunt Street is one of Red Hook's main thoroughfares, and the activities listed below begin at Baked (359 Van Brunt). To get there by bus, take either the B61 or B77. The closest subway is the F at Smith and 9th. Or you could travel by boat: The NY Water Taxi has a dock at the Fairway supermarket and NYC Ferry docks at Atlantic Basin. This Red Hook bakery and coffee shop has received rave reviews from everyone from Bon Appetit to the New York Times. Try one of Baked's pastries, and you'll see why. The homemade oreos, the Red Hook "red hot" cake, and, if you're feeling decadent, the melt-in-your-mouth sweet and salty brownie are all well worth a try. This den of deliciousness offers free Wi-Fi and serves up savory goods, too. From Baked, walk south on Van Brunt until you see Coffey Street. Take a right, and after a couple of blocks, the street will dead end into the Louis Valentino, Jr. Park and Pier, a small waterfront park. Green, filled with flowers, and located directly on the river, the park offers a multitude of grassy spots perfect for reading or sunning or gazing out at the boats floating by. Pack a blanket, and enjoy a peaceful Brooklyn morning. On Tuesday nights in the summer, Red Hook Flicks hosts a summer-long free film festival at the pier, complete with local food vendors. Skip the popcorn and pick up a Steve's Authentic Key Lime Pie. If you're a pie fan, then you won't want to miss Steve's Authentic Key Lime Pies. When you leave the Valentino Pier, just head back along Coffey, and you'll see signs pointing you towards the pie shop. Not hungry? Don't worry, the 4-inch tart, is small and perfectly shareable, but if you're a chocolate fan, you must order The Swingle, a frozen chocolate covered key lime pie on a stick. But if you want to stick yo an original pie remember — according to Al Roker, these tarts are the "last genuine key lime pies in the US!" The Danish furniture chain only has one location in New York City meaning people flock to Red Hook to search for new furnishing and to eat some of those meatballs. Get some home inspiration from the staged rooms and after navigating the store's maze treat yourself with something from the food court. Don't forget to pick up a box of freshly baked cinnamon rolls before you leave! Go directly from Manhattan to Ikea and back on the NY Water Taxi which has a dock right in front of the store. Step aboard the historic restored seaworthy barge docked in Red Hook, Brooklyn and explore at Waterfront Barge Museum. The Lehigh Valley No. 79 is open to the public on Saturdays from 1-5 p.m. year round and also on Thursdays from 4-8 p.m. in warmer months. Explore the vessel, see the Captain’s original living quarters, and a collection of tools used by longshoremen and stevedores. They also have a whirling ball machine, which is a fantastic permanent art installation that mesmerizes both kids and adults. After a couple of hours spent wandering around Ikea, you may be in need of a pick-me-up. If so, head to the Red Hook Ballfields for an afternoon snack. From Ikea, head east on Halleck Street, turn right onto Columbia Street, and then turn right onto Bay Street. It's about a ten-minute walk. Walk off those quesadillas while perusing the aisles of local indie bookstores. Pioneer Books located on Van Brunt Street has a collection of books on art, poetry, etc, and is apart of Pioneer Works, a "a center for research and experimentation in contemporary culture," with an exhibition space open to the public on Wednesday through Sunday, noon to 6 p.m. Afterward head down Van Brunt toward Union and make your way onto Columbia Street. Walk north until you see Freebird Books. This cozy gem of a used bookstore is a book lovers' dream come true. Owned by Brooklyn resident Peter Miller, Freebird offers ongoing literary events, a wide selection of reasonably priced books (both used and new), coffee, teas, wine, beer, snacks and an outdoor patio. Go south for a couple of blocks until you reach Alma. This is an area that is outside of Red Hook in Carroll Gardens West. However, it offers one of the best outdoor dining destinations in Brooklyn, Alma offers standard Mexican dishes like fajitas and enchiladas alongside delicious drinks and an extensive menu of house-infused tequilas. Sit on the restaurant's rooftop terrace, and you won't be sorry; the views of the Manhattan skyline are fantastic, especially once the sun goes down.